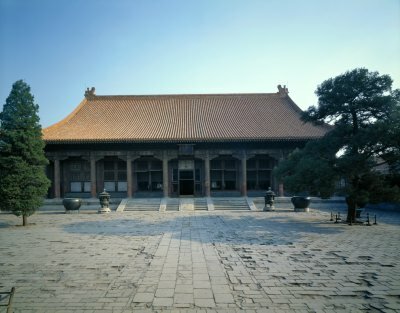 The Hall of Joyful Longevity (Leshou tang) is located to the north of the Hall of Spiritual Cultivation (Yangxing dian). Now it is a gallery of the Treasure Hall. It was built in 1776 for the Qianlong Emperor (r. 1736-1795) to read and rest in his remaining years after his abdication. The interior is mainly decorated with nanmu wood wrapped with the precious zitan and huali wood. Jade stone carvings and enamel artifacts are placed to indicate dignity and luxury. In the north chamber of the hall, the museum's largest jade sculpture illustrating the legend "Sage king Yucontrolling the flood" is displayed in the center. Along the corridor walls in the courtyard of the hall are Qianlong Emperor's copies of classical calligraphy and transcription of quotations.